Restless Chipotle » McKinney Restaurants: Go. Eat. Repeat. McKinney Restaurants: Go. Eat. Repeat. 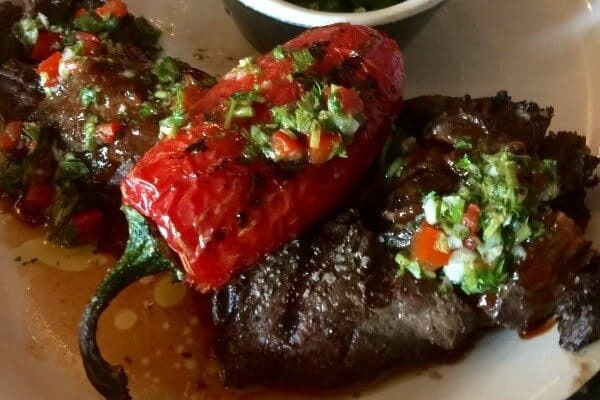 Figuring out where to eat in McKinney is tough, not because there aren’t many but because there are so many McKinney restaurants that you’d like to try it’s hard to choose just one. 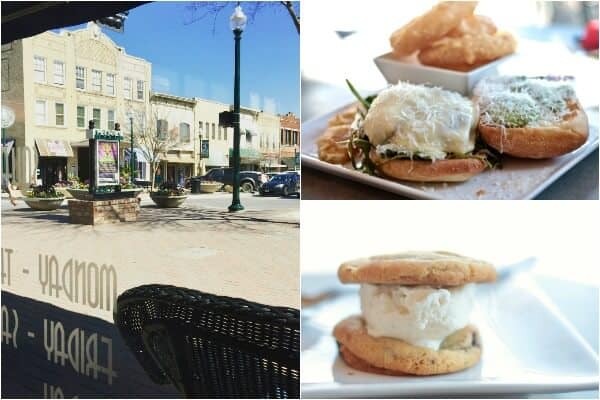 You wouldn’t expect to find much culinary excellence and sophistication in a little Texas town but McKinney is stocked with just that. Many (if not most) of the eateries focus on local and seasonal foods prepared simply and with excellent attention to all the little details. 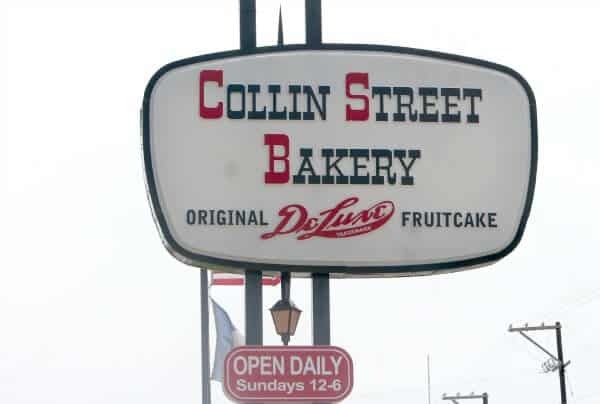 The eateries that I enjoyed were just a few of the many spots to choose from in the historic district alone. Keep in mind that most of these menus are seasonal and so the items that I enjoyed may not be on the current menu. No matter, I promise that whatever these McKinney restaurants are offering will indulge you in an extraordinary gastronomic adventure. My husband and I were invited to experience historic McKinney, Texas at no cost to ourselves. All opinions expressed are my own. A special thanks to McKinney Visitor’s Bureau for all of their help in making arrangements for this series. If you like to people watch and love a great burger Square Burger is a great choice. 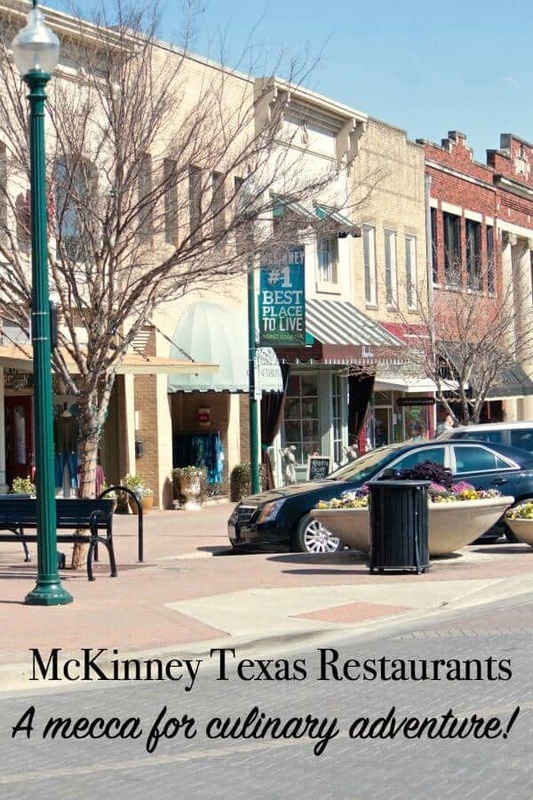 It’s located on a busy corner in historic downtown McKinney. Ginormous windows wrap around the building on two sides giving you a great view of everything that’s happening. In fact, it was tempting just to sit there and people watch! This casual restaurant serves an array of imaginative burgers made with local, grass-fed beef. The meat is delivered daily to the restaurant by the butcher shop just down the street, Local Yocal. I had the Parmigiana Burger and it was amazing. The burger sits on a toasted ciabatta roll with basil garlic tomato sauce, grilled onions, arugula, basil pesto, and smoked Mozzarella. I shouldn’t even have to tell you that it was amazing… but… it was AMAZING. I finished with one of the mini ice cream sandwiches made with cookies. If you like beer on tap you’ll be happy to know that there is literally and entire wall of taps for local and craft beers. The have over 30 varieties. Harvest Seasonal Kitchen isn’t just the name of the restaurant — it’s the philosophy and mission of the owner. There is no middle man here. No huge trucks delivering produce from South America. Real farmers, ranchers, and growers are the only sources of the food you’ll be eating. And the food is delicious. I’m not one to go crazy over deviled eggs but these were piquant with mustard seed, pickled onions, and a candied pecan perched on top. Don’t skip them – really. The steak that was placed in front of me was beautifully plated and perfectly prepared. It had been marinated in black garlic and was served with a small cocotte of sautéed mustard greens with bacon as well as a few other sides. Chef wrings every molecule of fresh flavor out of the ingredients and creates delicious twists to traditional Texas fare. The dessert was a glorious smoked chocolate tart with gooey caramel. Totally hedonistic. Totally worth every single calorie and subsequent hours on the elliptical at the gym. YOLO. 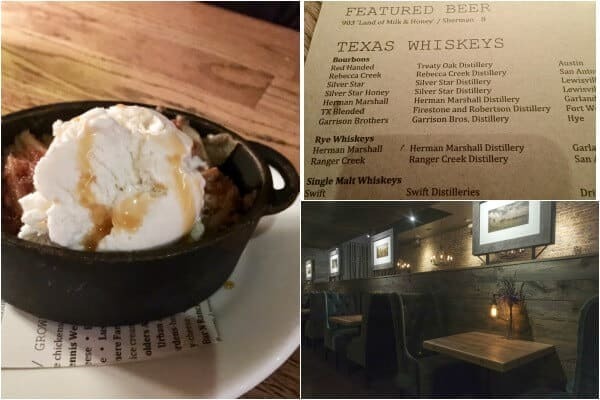 If you happen to be a whiskey aficionado you’ll enjoy the extensive whiskey menu here.. There’s an entire section of Texas whiskeys — and they were so perfect that I wouldn’t let my husband add Coke to his until he’d sipped it a few times. I’m bossy like that. We enjoyed lunch at rye. craft food and drink. Our breakfast at the Red Gate Inn had been huge and we were still kind of full but we soldiered on bravely. The aroma in the restaurant wouldn’t let me skip lunch for sure. It’s amazing that all of the McKinney restaurants I visited were so good. Not a dud in the bunch. The food was, without a doubt, scrumptious. I’ll get to that in a minute because I want to tell you about the cocktails. And yes, it was the middle of the day and I totally indulged in cocktails. From Prohibition era classics to modern mixtures rye. has one of, if not the, best cocktail menus I’ve experienced in my lifetime. 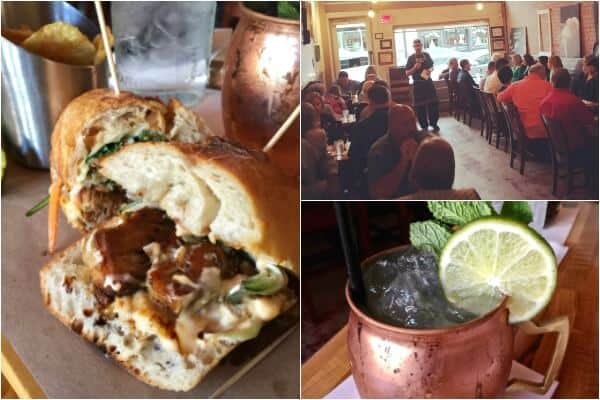 They use handcrafted syrups, house-made infusions, and fresh herbs. I had the Downtown Mule made with house-made ginger beer and it was spicy enough that I asked if they’d snuck a little jalapeno in there. It was delicious — sadly it was even better than my own Texas Mule. Bien Salsa is not your everyday Tex-Mex food. Traditional recipes from various regions of Mexico are expertly prepared and beautifully presented in a relaxed, friendly atmosphere. You could as easily enjoy a romantic dinner for two as you could have a birthday dinner for the whole family. We walked into Bien Salsa just in time for dinner. 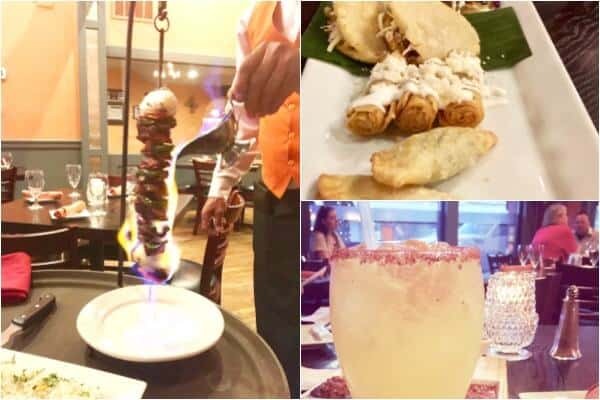 This is not your everyday Tex-Mex but the menu contains traditional Mexican cuisine from different regions of Mexico. It is expertly prepared and beautifully presented – anything on the menu would be amazing. Still, I have to say that the Brochetas de Carne , a kabob that’s tequila flamed at the table, was as dramatic as it was delicious. The Mirella Sampler gave me a taste of a variety of dishes. It’s a great choice for the food adventurer. Full disclosure – I did not visit Sugar Bacon Proper Kitchen on this particular trip but had been there before and didn’t want to leave it out. Like all the McKinney restaurants I visited, Sugar Bacon Proper Kitchen is in the historic downtown area. Sugar Bacon Proper Kitchen is a large, airy space that abounds with industrial chic decor. Bright colors, smooth surfaces, and bright lighting all give this eatery a lot of personality. It’s just fun. AND it used to be the gas station way back in the day. I loved the house made tater tots with pulled pork, pimento cheese, and bbq aioli. They looked and smelled so good that I couldn’t wait for them to cool – and it was well worth the singed tastebuds. 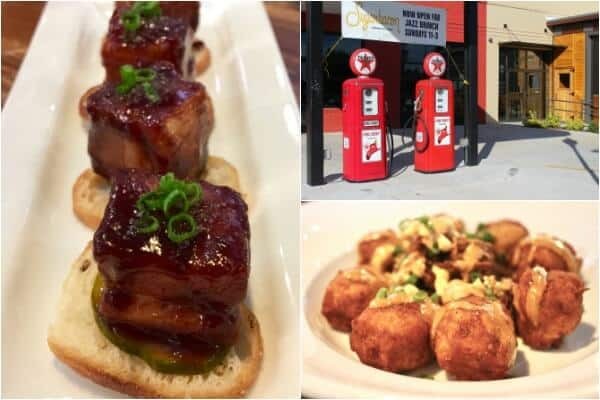 The sugar bacon is small squares of house smoked Berkshire pork belly glazed with an ancho bbq sauce and served with crunchy bread and butter pickles. It’s one of my favorites and I really hope you’ll give it a try. I had the smoked Berkshire pork chop served with green chile hominy and an ancho apple salad. It’s one of those meals that you wake up in the middle of the night and consider driving an hour so that you can have it again. Not that I have ever considered that kind of craziness. Ahem…. Are there other McKinney restaurants? You bet there are! I just haven’t tried them yet. Heavy emphasis on the word yet.